C1551. BRUNO MADERNA Cond. RTF S.O. 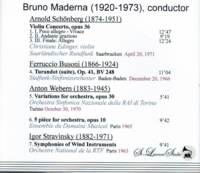 : Symphonies of Wind Instruments (Stravinsky); BRUNO MADERNA Cond. Enesmble du Domaine Musical: Five Pieces for Orchestra, Op.10; BRUNO MADERNA Cond. 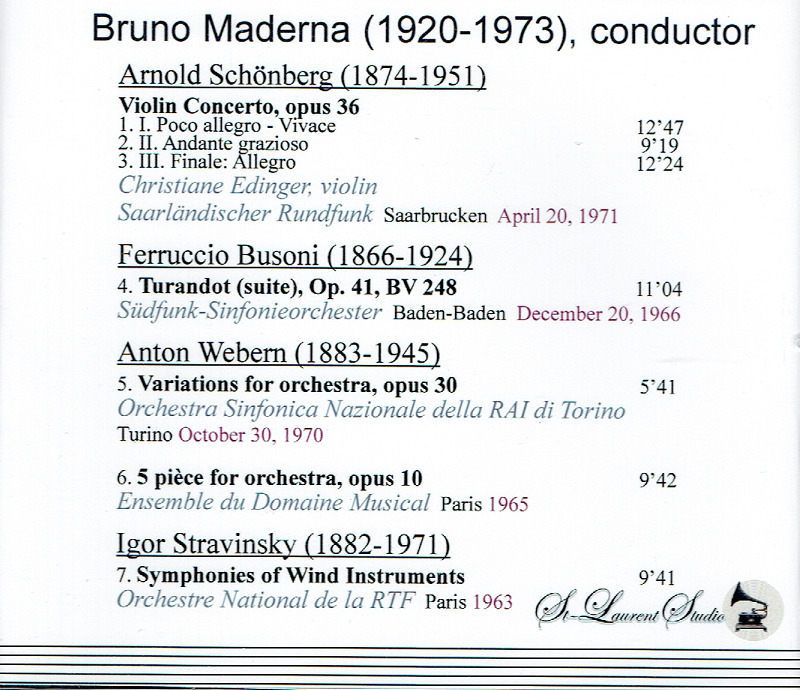 RAI S.O., Torino: Variations for Orchestra, Op.30 (both Webern); BRUNO MADERNA Cond. Südfunk-Sinfonieorch. : Turandot - suite (Busoni); BRUNO MADERNA Cond. Saarlärlandischer Rundfunk S.O., w. CHRISTIANE EDINGER: Violin Concerto, Op.36 (Schönberg). 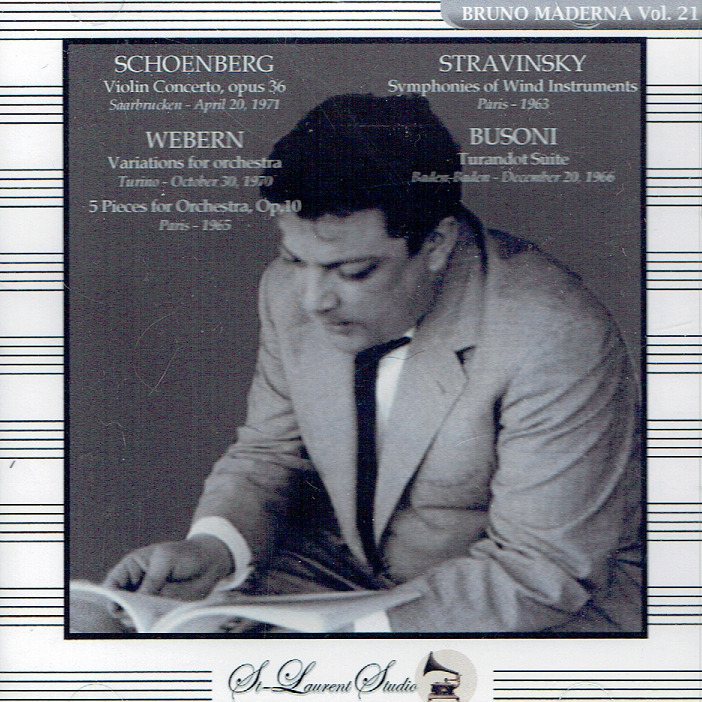 [Another brilliant and fascinating Maderna issue from Yves St Laurent; the Schönberg Violin Concerto is irresistible!] (Canada) St Laurent Studio YSL T-476, Live Performances, 1963-71. Transfers by Yves St Laurent. “While she has often been associated with the standards of the violin repertory, particularly those from the German School, Christiane Edinger has played a variety of works throughout her career, including concertos by Tchaikovsky, Saint-Saëns, Elgar, Prokofiev, Bartók, and Khachaturian, as well as several by contemporary composers like Penderecki, Bernd Alois Zimmermann, Boris Blacher, Howard Blake, and Cristobal Halffter, who wrote two concertos specifically for her. Though she has lacked the superstar status of modern string players like Anne-Sophie Mutter, Edinger was and still is recognized as one of the finest German violinists of her generation. She has performed with the leading orchestras in Europe and the Americas and has collaborated with such conductors as Herbert von Karajan, Neville Marriner, Kurt Masur, Christoph Eschenbach, and many others. She has also regularly performed chamber music, notably in her ensemble, the Edinger Quartet. Her recordings are still widely available on a range of labels, including ASV, Arte Nova, Audite, Naxos, Orfeo, and others.